This rainforest provides more than oxygen. Henry Brant (b.1913), America's senior experimental composer, has never been one to shy away from big topics; he has already outdone Leonardo da Vinci's coverage of meteors, hurricanes, craters, and forces of nature. Back in 1989, when there was still something to save, long before Al Gore and Sting, he took on the rainforest. Written for the Santa Barbara Arts Festival, Brant's Rainforest sets colorful texts by Abd al-Hayy Moore concerning the animals, plants, sounds, people, and destruction of our planet's lungs. The ecology of the forest, with its myriad connected lives, is matched by the musical performing forces: four singers and a spatially-separated instrumental ensemble with two conductors. Described as an environmental spatial oratorio, Rainforest is heard here in a stunning performance at the 1989 Aspen Music Festival. It needs to be listened to more urgently than ever. Solo voices: Michele Eaton, Mary Nessinger, Mark Conley, William Riley. Ensemble of 21 instruments conducted by Henry Brant and Amy Snyder. Good intentions and political correctness rarely produce good music (and, I am sorry, but I do not consider the finale of Beethoven's 9th to be his best music) - but here, they have. 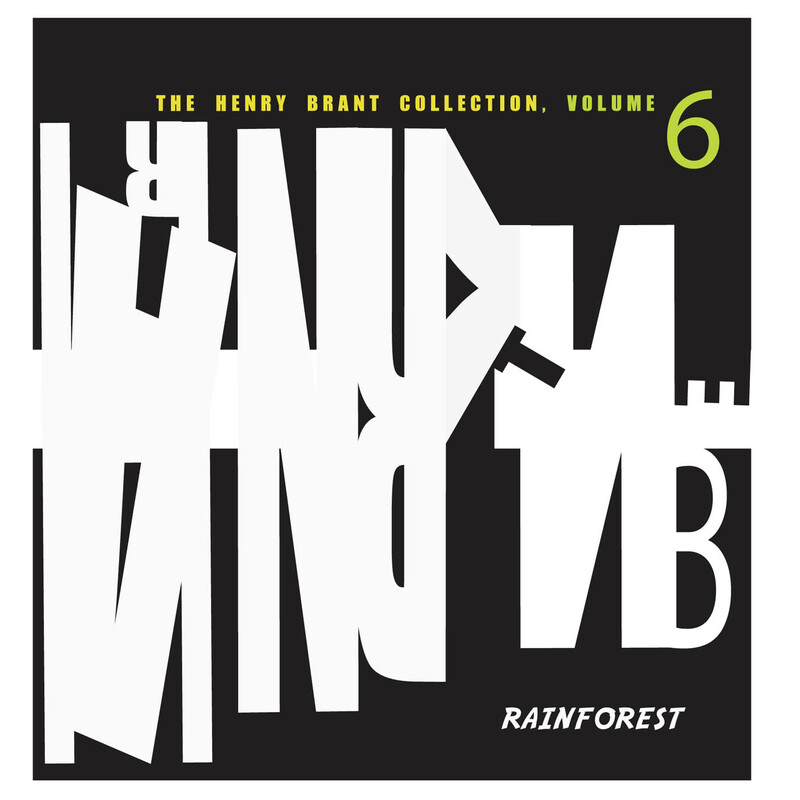 "Rainforest" is a substantial piece of nearly an hour (58:30), composed in 1989, and involving four vocal soloists (SATB, with the tenor apparently also singing in falsetto voice at one point, and the baryton also acting as reciter) and a normal orchestra with single winds and brass and a lage percussion section. The text is by Abd al-Hayy Moore - an American poet, born Daniel Moore in 1940, who embraced the Sufic tradition of Islam in 1970 (the liner notes do NOT give these details: thanks again Wikipedia). It has the rain forest speaking, and thus manages to avoid the embarrassing impression of naïvete oftentimes deriving from texts concerned with the issues of environmental destruction and protection - Tippett's Mask of Time, which does contain wonderful music, may come to mind (Sir Michael Tippett - The Mask of Time (2 CD Box Set) (EMI)). The vocal writing is often of spoken-declamatory nature - and if I'd have one reservation it is that at times I feel that Brant is a little TOO declamatory and intent at conveying a message, especially in the framing "Prologue" and "Epilogue". Nonetheless, Rainforest is a piece of great compositional imagination and evocative power. It has passages of deep and moving lyricism, sometimes with a floating, chant-like, religious aspect (as in track 1, "Prologue"), and passages of highly atmospheric and colorful orchestral invention, with lots of solo work imitative of faunas of exotic birds and animals. In this vein, the fourth movement, "Chatter" is remarkably original: the text is no more than a list of numerous exotic animals, many of which I had never even heard about - Agouti, Boa-Constrictor, Jaguarundi, Margay, Coatil, Paca,Tapir and so forth - sung by the four soloists, if I am not mistaken, in imitation of the said animals' cries, over jagged orchestral interjections evoking the sounds of the jungle - I imagine (I've never actually been there). Fascinating. There is also the superb 3rd movement, "rain", in which the orchestra is both very graphic and wonderfully imaginative, depicting the first few irregular raindrops (I think there is harp, piano, maybe celesta, then bass pizzicattis), then accelerating. I've recently been listening to a lot of Villa Lobos' "Amazonian" orchestral music (see for instance my reviews of Villa-Lobos: Genesis / Erosao / Amazonas / Dawn in a Tropical Forest orA Brazilian Extravaganza - Heitor Villa-Lobos: Chôros No. 8 / Fantasia for Cello & Orchestra / Uirapuru / Marlos Nobre: Convergências - Janos Starker, Cello), and here Brant appears really like the true modern heir of the Brazilian composer. Later in the same movement there is a passage in wailing declamation reminiscent of Ravel's L'Enfant et les sortilèges, when the animals call "maman". The vocal writing is also quite original in the 7th movement, "Wasteland", each soloist howling out one word in succession out of the three verse, over brooding orchestral counterpoint with harp interjections. There are also moments of unleashed violence with powerful brass and percussion (try track 1 at 2:53, track 3 at 2:27 or the whole of track 6, "destruction", and also the Epilogue's coda starting at 6:49). Brant's flirtation with Jazz, already encountered in his compositions for flute ensemble (see Henry Brant: Music for Massed Flutes), is again heard here (in track 5 "Indigenous peoples"), as well as his fascination with Gregorian Chant and Renaissance Church Music (same track at 4:11, on the words "My mother gave me being inside of rain cloud...", passages in track 8). Brant's orchestral inventiveness is stupendous.